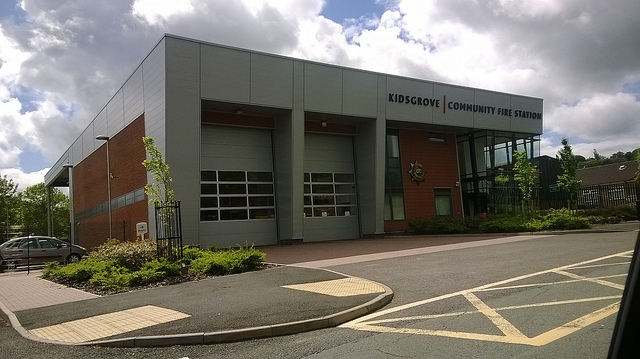 The future of how fire services are to be provided in Kidsgrove are to undergo a review that could see the Kidsgrove Community Fire Station in Lower Ash Road closed down. Over the next 12 weeks the Fire Service will be consulting with the community on the options for change. • Only have the station operational at times of highest demand. • Replace the current fire appliance with a smaller vehicle and crew. • To remove the fire appliance and crew from Kidsgrove. • Work with Cheshire Fire and Rescue Service to provide a combined response from stations at Alsager and Kidsgrove. The need to meet financial challenges due to cuts in funding and a decrease in demand (over the past 5 years fire calls in the Kidsgrove area have fallen from 383 to 85 per year) has led to a review of how the Fire Service combines their prevention, protection and response activities to make communities safer, meet the challenge of reduced public sector funding and reflect the changing demands and risks placed on the Service. The Service has already saved £4 million since 2010 and will have to save an additional £5.7 million by 2020. • Automatic Vehicle Location System Technology which allows the nearest available appliance to an incident to be mobilised rather than just calling the nearest station. • The positioning of Sandyford Community Fire Station and lower turnout time of whole time crews in comparison to retained crews means that Sandyford is often mobilised as the quickest available asset to calls within the area. • General reductions in emergency incident calls across Stoke-on-Trent and Staffordshire. Members of the public are being invited to a consultation event in Kidsgrove to discuss the options for change being proposed. The session will start at 6pm on Wednesday, March 25, at Kidsgrove Victoria Hall and is part of a 12-week Community Safety Options consultation. The community fire station with state of the art facilities was opened in September 2011 costing £2.9 million and was expected to have a life of around 60 years. It replaced the old station that had been in Lower Ash Road since 1965 as part of a private finance innitiative (PFI) that has seen a number of community fire stations open throughout Staffordshire. One of the aims of the new station was to improve facilities and strengthen links with the local community.